An incredible talent, David Fulcher was a safety best known for his hard hitting play, ball hawking skills, and gifted abilities in Tecmo Super Bowl. At 6’3″, 238, Fulcher was of a rare breed of safety whom could line up and play as an extra linebacker, or fade back into coverage with his speed. After his Junior season at Arizona State in 1986, he’d declare for the ’87 draft. The Bengals liked what they saw, and handed him the starting job out of the gate at Strong Safety after taking him with the 78th pick out of the 3rd round. It didn’t take him long as he made his first two interceptions, picking off Warren Moon of Houston during week 7 in a 31-27 win. 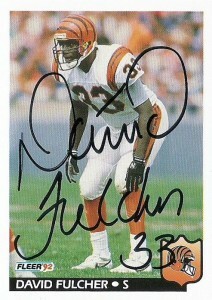 By 1988, Fulcher had emerged as one of the most dangerous defensive backs in the AFC, earning the first of 3 consecutive Pro Bowl nomninations. A cornerstone of the Bengals defense, Fulcher’s emergence as a dominating defensive presence coincided with the Bengals second Super Bowl appearance after the season. 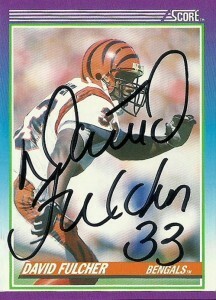 In 1989 he won All Pro honors after notching 8 interceptions and recovering 4 fumbles. 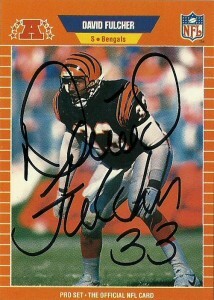 Fulcher was a fixture for the Bengals through 1992 when injuries limited him to just 12 games that season.At the time of his departure, he was ranked 3rd on the Bengals all time interception list. Exposed to free agency, he moved on to the Raiders in 1993 but retired after the season due to lingering injuries. David has given a lot of his time back to the sport he loves. He runs a football camp in Ohio, and conducts many youth and charitable events in the Cincinnati area. David currently spends time as a head coach for a local Christian school and also with the NFL and the Bengals. Fulcher is infamously memorialized as one of the best defensive backs on the classic Nintendo game “Tecmo Super Bowl”.